The Mediterranea Hotel and Suites , is located at the top of a hill, commending a breathtaking view of both the picturesque fishing harbour as well as the historic St. Paul's Island . The bay below the complex provides excellent aquatic sports and bathing facilities. This apart hotel offer accommodation on self catering too and each hotel room, studio, one bedroom and two bedroom apartments are fitted with rustic furniture, a private bathroom, direct dial telephone, satellite television, radio, air conditioning and kitchette Hotel facilities include a roof top swimming pool, an outdoor Jacuzzi , a Breakfast Room and a Bar. The Park Hotel - a contemporary hotel in the heart of Sliema, situated less then 100m away from the inspiring and popular seafront promenade. Warmth and style are the common factors reflected in the hotel environment and its renowned service is always offered with a smile. The hotel has 122 twin bedded rooms, 12 studio type rooms and 18 suites, all with private bathrooms, air-conditioning operating most of the summer and furnished to a comfortable standard. Rooms are designed in a cosy colour scheme and are also equipped with direct dialing telephone, colour TV, hair dryer, private personal safe deposit boxes (at a small charge), mini frigo and tea/coffee making facilities. The studio type rooms are ideal for those couples who would like to have the self-catering facilities within the room. These are fully equipped with direct-dial telephone, colour TV, hair dryer and private personal safe deposit boxes (at a small charge). The small kitchenette incorporated in the room includes a fridge, microwave oven, 2 ring burner and all the necessary utensils necessary to prepare a small meal. In order to guarantee safety, the room is also equipped with a fire extinguisher and a fire blanket. The Sunflower is a beautiful and quaint 3-star hotel that has built a reputation for quality and value. The hotel is minutes away from the sea and located in Qawra, St Paul’s Bay. Opening its doors in 2003, the Sunflower Hotel has bright and airy rooms which are all fully air conditioned and WiFi is available throughout the hotel. The amenities and service go way beyond the standard, offering quality and exceptional value. Upon entering the hotel lobby, the pleasant atmosphere and surroundings greet you welcomingly. The hotel has gained rave reviews for its personalised, bespoke service over the years with guests returning again and again. At The Victoria Hotel your dream day will be become a reality. The Victoria offers two choices of venues, the magnificent Copperfield's Restaurant, which can take up to 120 guests seated or 250 standing and the elegant William Shakespeare Suite on the first floor, which can cater for up to 100 seated or 200 standing guests. We ensure settings in a grand style, combining class and elegance together with good food and excellent service. The Sunny Coast Resort Club is located in one of Malta's most beautiful bays; Qawra Bay. The Hotel offers a relaxing experience where each guest can enjoy the Maltese hospitality and a pleasant Mediterranean way of life.This Complex offers the ultimate in self catering accommodation and it also has its own Leisure Centre. In a separate area across the hotel and literally by the water's edge is the Leisure and Fitness Centre with its beach, large outdoor swimming pool together with a children's pool, three jacuzzis, a heated indoor pool, Holistic Health Spa, squash court, water sport facilities and a fully air-conditioned gym. Enjoying an exclusive location close to Malta’s largest sandy beach and graced with acres of beautifully landscaped gardens. The Mellieha Bay Hotel is a regular meeting place for repeat guests from all over the world who have come to refer to the hotel as their ‘home away from home’. Each of the 313 rooms is sea-facing, offering breathtaking views of the sparkling blue Mediterranean Sea, with the imposing vista of Mellieha village church as its back-drop. The excellent staff and the vast array of facilities ensure you’ll want for nothing during your stay. Those who have stayed at the Mellieha Bay Hotel are familiar with the superb sea-views that each room enjoys. The magic of the blue Mediterranean sea enters through the windows and balconies of the 313 rooms offering a spectacle of colour, sound and salt fragrance. This Mediterranean charm is flanked by a friendly and efficient housekeeping service ensuring that your room is clean and tidy for a comfortable stay. Rooms are available for single or twin occupancy with the opportunity to add an extra one or two beds. Interconnecting Rooms are also available. Each room enjoys a seaview balcony or a sea-facing patio. The Mellieha Bay Hotel is renowned for its excellent cuisine and service. The bars and restaurants offer wining and dining with a local touch. The atmosphere is informal yet wonderful, and you’ll enjoy the specialities crafted by our Executive Chef, Charles Vella. The Mellieha Bay Hotel is superbly located close to the largest golden, sandy beach in Malta and yet only 3km away from the bustling village of Mellieha. This brings beach and bowling, diving and dancing, relaxing and shopping all within easy reach. The Hotel itself offers an abundant selection of leisure activities for all age groups. The Bowyer House is centrally located in Tarxien, opposite the church of St. Bartholomew. It is a 5 minute walk from the Hypogeum and Tarxien Temples. The Bowyer House contains 36 rooms, all of which are large and comfortable, simply furnished with fans and a private en-suite bathroom. The number of beds in each room varies from 1 to 5 and each bedroom has a private locker. Some rooms have a balcony. Breakfast is included with your stay. There is an outdoor pool in a pretty courtyard with tables and chairs. Our sister restaurant Il-Kastell Wine Bar is situated next door. A combined offer is available for all guests at The Bowyer House to enjoy a romantic evening at the restaurant. Please contact us for more information. Check in is at 1400, and check out at 1100. Late arrivals are accepted with notification. The Bowyer House provides sports and leisure activities, including an outdoor swimming pool, large sun terraces, a large inside table tennis facility and a large fully equipped competitive gymnastics gymnasium. All are available for training camps for gymnastics, table tennis, and several forms of dance. We also provide transport to and from the airport, cars for hire and tours. For further information please feel free to contact us. Directions: The Bowyer House is centrally located in Tarxien. From the airport you can take bus X2, X3, or X7 to Paola stop Paola 2. There you can change buses to bus 81, 82, 204, 206, or 210 going away from Valletta. Get off at the third stop, named Tarxien. From the bus stop, walk the direction the bus came from and take the first right. We are straight ahead, 30 meters on the right. The nearest bus stop is at the corner 30 meters away. The buses go to the beach or directly to Valletta about every 15-30 minutes. 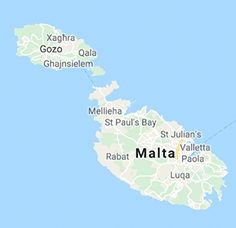 Malta's International Airport is 5 minutes away by car or 15 minutes by bus. Situated in the North of Malta, the Seashells Resort at Suncrest is one of the leading 4 star resorts on the island. The resort is ideally located on the Qawra seafront and is merely a 30 minute drive away from the major heritage sites and cities. Due to its prime seashore location, the Seashells Resort affords breathtaking views of the Mediterranean sea. Accommodation includes 452 rooms, most of which have stunning sea-views. The majority of the rooms enjoy private balconies and each room is fully fitted with a range of facilities to ensure maximum comfort. Dining at the Seashells Resort at Suncrest has been for many years a relaxing and enjoyable experience. With five different outlets, the resort offers a varied choice of cuisine from BBQ grills to traditional Maltese dishes. All eateries, except Tal-Kaptan, are included in the resort’s All-Inclusive package. A package which the Seashells Resort at Suncrest has truly taken up a notch. Seashells Resort at Suncrest is also complemented by a variety of leisure facilities. The pool area boasts a 42m long pool and a large pool deck area complete with sunbeds, umbrellas, a snack bar and evening entertainment. Should you be travelling with your family the resort also offers two kids pools, one of which has a fun slide. Guests can also make free use of the Fitness Centre which is only 150m away. The resort’s signature Spa facility offers the ultimate pampering experience and is the ideal remedy to finding mind and body balance. Maintained by professionally trained therapists, the Carisma Spa & Wellness is the secret ingredient to a luxury spa break in Malta. The range of treatments includes facials, massages, body wraps and also a select range of unique alternatives that reveal the exotic Turkish provenance of this Spa. The Spa also offers a Hammam (Turkish Bath), making the resort one of the very few which offer such a service on the Island. The Marina Hotel boasts an advantageous position overlooking the striking St George’s Bay area and the great expanse of the Mediterranean Sea. With its unsurpassed panorama, the hotel is just a short stroll from the vibrant neighbouring town of Paceville that hosts the islands main hotspots, and St. George’s Bay sandy beach. Ideally positioned at the water’s edge, the Marina Hotel is part of the Corinthia Beach Resort which includes the luxurious Corinthia Hotel St. George’s Bay, which offers a private beach club with easy sea access and a fully equipped water sports centre providing a variety of energising water sports as well as a professional diving centre. A Four Star property with a Five Star welcome. Vinotheque Bistro recaptures the ambiance and character of the traditional Mediterranean bistro, offering favourite Mediterranean dishes and an extensive wine list, featuring both local, old and new world wines. Another welcoming outlet within the Marina Hotel is Café 24. From the early morning to late at night, drop into Cafe 24 where our menu is designed to delight; a quick breakfast of coffee and continental style pastries or croissants, meet your friends in the afternoon for a light lunch, or relax with a delicious hot chocolate and choose from our pastry chef’s scrumptious homemade dessert selection.